I'm happy to announce the release of the GTORB Flop Solution Library which currently contains almost 200 pre-computed flop solutions from a variety of game types with many more to come. 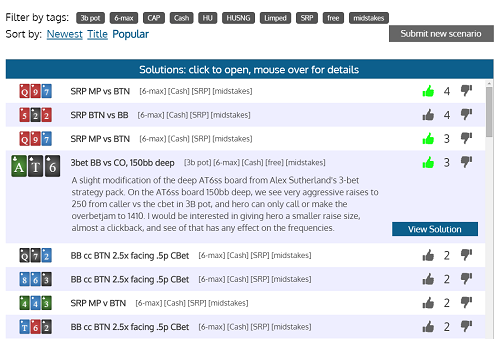 The solution library is searchable, and there are discussion threads for every solution where you can join our community in analyzing GTO play. Anyone can browse the contents of the library for free, even if they do not have a GTORangeBuilder account and we have made 3 of the solutions freely available to the public. The other solutions can only be viewed license holders and only license holders can submit new scenarios that they would like to see added to the library. Regarding licenses, all existing turn license holders have automatically been upgraded to GTORangeBuilder Pro licenses and will receive full library access for free. We also have removed the 250 monthly cap on turn calculations, you can now run as many as you want. Finally, we have removed the option to purchase a monthly GTORangeBuilder license and have instead replaced it with a 6 month license with no recurring charge or activation fee.